This Primer invites undergraduates to explore the range of feminist perspectives, including feminist empiricist, feminist standpoint, and postmodern perspectives in order to bridge the divide between theory and research methods. This text provides a unique "hands-on" approach to research by providing exercises and "behind the scenes" glimpses of feminist researchers at work. The in-depth examples cover the range of research questions that feminists engage with, including issues of gender inequality, violence against women, body image issues, and the discrimination of "other/ed" marginalized groups. The Primer is written in a clear, concise manner that invites undergraduates to explore and practice a wide range of research, from ethnography, oral history, focus groups, and content analysis to interviewing and survey research. A full chapter is devoted to feminist approaches to mixed methods research. 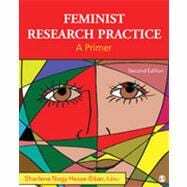 Feminist Research Practice: A Primer is committed to the idea that research methods are best understood utilizing a "hands-on" pedagogy. Research tips and checklists are provided along the way for the novice researcher.